Simon & Schuster, 9781476777832, 224pp. To read relevant passages from the original works of Chinese philosophy, see our free ebook Confucius, Mencius, Laozi, Zhuangzi, Xunzi: Selected Passages, available on Kindle, Nook, and the iBook Store and at Books.SimonandSchuster.com. Michael Puett is the Walter C. Klein Professor of Chinese History in the Department of East Asian Languages and Civilizations and Chair of the Committee on the Study of Religion at Harvard University. He is the recipient of a Harvard College Professorship for excellence in undergraduate teaching and is a member of the Royal Swedish Academy of Science. Christine Gross-Loh is a journalist and author. Her writing has appeared in publications including The Wall Street Journal, The Atlantic, and The Guardian. She has a PhD from Harvard University in East Asian history. "A remarkable combination of self-help guide and iconoclastic take on ancient Chinese wisdom... The authors superbly succeed at highlighting ancient Chinese philosophy’s tools for achieving its vision of a flourishing life... Confucius famously declared in the Analects, "I transmit, but do not innovate." Puett and Gross-Loh deftly do both." "Puett’s dynamism translates well from his classroom theater onto the page, and his provocative, radical re-envisioning of everyday living through Chinese philosophy opens wide the 'possibilities for thinking afresh about ourselves and about our future.' His text presents creative alternatives to the stale 'confines of our narrative.' With philosophical consideration, our methods of interacting and coexisting may, as the author promises, have the power to better our lives and our relationships. With its . . . spirited, convincing vision, revolutionary new insights can be gleaned from this book on how to approach life’s multifarious situations with both heart and head." "Offers interesting alternatives to some of our modern ideas of self and society . . . worth the cover price." "The Path will not only change your life--it will change the way you see history and the world. From its wondrously fresh take on Confucius to its quietly profound read of just what it is the great sages have to say to us, this book exemplifies all that can come of the radical openness of Chinese philosophy. Read it and be transformed." "If you're looking to get out of a rut, or rise above the doom and gloom of our present global situation, Puett's channeled knowledge from the Chinese masters will be a wake-up call. We sometimes forget that our problems are as old as civilization, and maybe the answers have always been hidden in plain sight." "This book opens the mind. . . . These thoughts echo in my life, even if the origins were unknown to me. . . .
Puett and his co-author have performed a service for all of us. They have succeeded in their project. Their accessible, conversational style introduces anyone with interest to what Chinese sages suggested about giving meaning to our days. Even more impressive, they inspire interest." "A very accessible and inspiring piece of work. . . . Anyone willing to put the work in might find that this book really can change your life." "The book is full of ancient wisdom and insights that can help you rethink the choices you make every day so that they lead to greater happiness and fulfillment." "Puett's book encourages us to chuck away our stiff, encrusted western notions, and to adopt a more fluid, less didactic approach to life. The Path is not your classic self-help book, and not just because it dismantles the self. It doesn't serve up an easy set of how-to activities. . . . You are also advised that any changes you make will be slow, incremental, the result of constant daily work. . . . To talk to Puett is to view our western tradition through an entirely different lens." 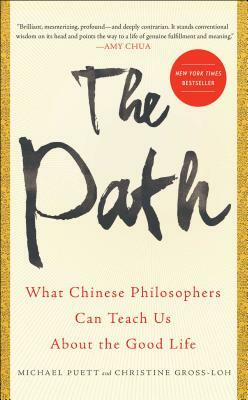 "The Path looks at the teachings of ancient Chinese philosophers and explains how we can apply these largely forgotten teachings to our everyday lives. Granted, it sounds like a tough read. It sounds specialist and niche and intimidating. It sounds all of those things. But it is none of those things. It's a big ask in under 200 pages. But there's something wonderfully simple and refreshing about the ideas. There is a simplicity to this book: all we have is ourselves, let's try and make things better." "Puett's course has become the most popular on campus, even with those studying other subjects, and that's because he talks about how to have a good life. Using ancient Chinese philosophy challenges all our modern assumptions about what it takes to flourish in life." "This beautifully written book is a must-read. . . . The Path has tremendous riches to offer young people (and not so young people) precisely because it begins with a challenge to Western notions of the Self. . . . This slender little book carried a very big punch." "[The Path is] 1) a disrupting challenge to almost any rigid worldview and 2) a brief overview of Chinese philosophy. . . . The authors repeatedly point out that these philosophies are not just abstract 'big question' type approaches; they are intended for use and exploration thru the daily nitty-gritty of real life. . . . Though in some cases, you’ll have to go deeper into these 'paths' to figure out how, this book is a good place to start."